to sum up all things in Christ, in heaven and on earth. R. (2a) The Lord has made known his salvation. R. The Lord has made known his salvation. When we bought our little house, we had a toddler son and were expecting another baby. Our plan was along the lines of, “Two and we’re through.” Well, fourteen years, two conversions, and six additional kids later, there are now ten of us living in that same little 1500 square foot house. These days, rather than charming and full of character, our house feels constrictive and messy, if not disastrous. We don’t have a garage, so our large front porch houses sports equipment, bicycles, and more shoes than the average person will own in a lifetime. Maybe that’s an exaggeration, but oh, the shoes. We’ve become extremely creative when it comes to bedrooms, especially considering that technically our house only has two. We’ve made a few offers on bigger houses over the years, but nothing has panned out. Each time I’ve had peace that we must be meant to stay put. I’m usually very good at making the best out of every situation, especially the small house situation. But recently, I’ve started hitting a wall. I can’t seem to manage our space anymore. Despite my ongoing efforts to battle clutter and unessential material things, we are exploding out of this house. My kids are growing up, my oldest three being teenage boys. There are days when I stand at the kitchen counter with tears of frustration running down my face and I beg God, “Please, save me!” I’m sure He appreciates my dramatics. Sometimes it feels like the walls are caving in as I see the mess of our family life in every direction all to the tune of my kids arguing in the next room. I worry that I can’t be the mom I want to be because I’m so distracted by the chaos of my environment. I want the material blessings: the bigger house, one with a garage, maybe a basement for storing off-season clothing, another bedroom or two. What I truly need though, are the spiritual blessings. Thankfully, these are promised. As the First Reading tells us, He has “blessed us in Christ with every spiritual blessing in the heavens.” He lavishes His grace upon us. No matter our living situation, His grace will be sufficient. Maybe we will get the house. Actually, I’m talking about a very real house (one that we just may be able to buy this time). But if it doesn’t work out, yet again? I pray that my eyes will see the abundance of His blessings, and not my lack of storage space. 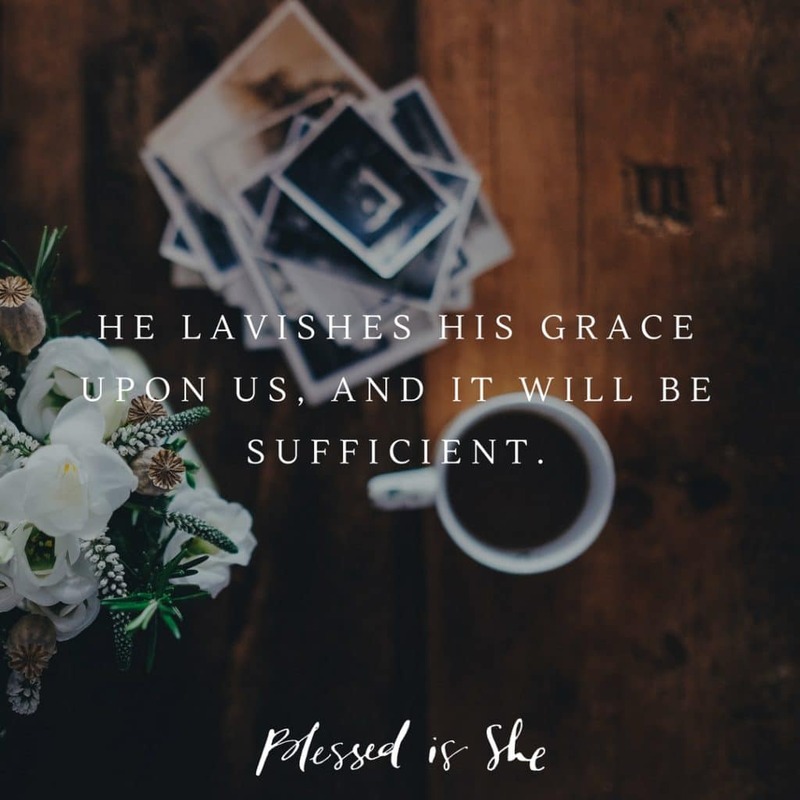 He lavishes His grace upon us, and it will be sufficient. Do you find yourself turning to despair in your circumstances? Is frustration impeding your ability to spot your blessings? Re-read this epistle. Let the words sink into you. Believe them. Trust them. Ginny Sheller lives in a little old house in Virginia with her husband and eight children. They keep bees, goats, and chickens and rarely have a clean house or a quiet moment. She knits everyday to maintain sanity. You can find out more about her here.